all on mount: lower right in graphite: Berenice Abbott; center verso in graphite: Federal Art Project / W.P.A. N.Y.C. / Berenice Abbott Sig. ; center verso: artist's stamp; lower left verso in graphite: "Canyon" / Broadway & Exchange Place / Manhattan / neg 150 July 16 1936 / Code # I.e. (Andre Emmerich Gallery, New York); private collection, Los Angeles; (sale, Christie's, New York, 12 October 2000, lot 49); NGA purchase, 2000. New York in the Thirties. New York, 1939, no. 12. O'Neal, Hank. 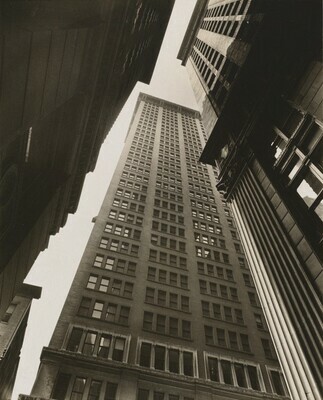 Berenice Abbott: American Photographer. New York, 1982, 162. Yochelson, Bonnie. Berenice Abbott: Changing New York. New York, 1997, no. 18, p. 343.